Chiusi is a small town in the province of Siena that borders Castiglione del Lago and Città della Pieve, two renowned localities in Umbria. Located a few steps from popular Tuscan destinations as well, such as Chianciano Terme (thermal resort) and Montepulciano (renowned for its prestigious wines), Chiusi is a perfect base location for exploring the surroundings, where you’ll find plenty of things to see and activities to do. Thermal spa in Chianciano o Bagni San Filippo, wine-and-food tours in Montepulciano, Montalcino and Pienza, trekking excursions to the discover of Mount Amiata, or the unspoilt nature of Val d’Orcia, Valdichiana, Crete Senesi and Val dell’Ombrone, just to mention the closest attractions. Chiusi is well renowned for being one of the most important Tuscan Etruscan archaeological site: there you may visit the Poggio Renzo Necropolis with its Etruscan tombs (such as Tomba della Pellegrina and Tomba della Scimmia), all still well preserved with their typical Etruscan drawings. If you’re passionate of local culture and history, there’ also the Chiusi National Archaeological Museum that exhibits all the findings of the area, and the Cathedral Museum (the visit to that Museum also includes a tour to the undergrounds of Chiusi, a series of hidden tunnels that are actually worth your while, like Porsenna Labyrinth). For all those keen on excursions amidst nature, the Chiusi Lake is located at a stone’s throw to the city center (a few kilometers away there’s also the Montepulciano Lake): it’s a Natural Protected Area of Local Interest for the varied animal species that live there, surrounded by the gorgeous landscape of Valdichiana. Located on the historical railway line that connects Florence to Rome, Chius is easily reachable by train from both the two cities, as well as from Siena. If you prefer getting there by car, take the Autostrada del Sole A1 Florence-Rome and exit at Chiusi. 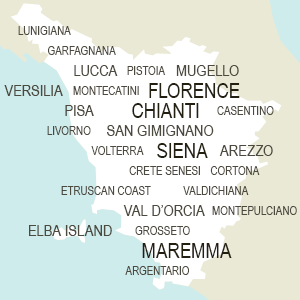 A few distances: Rome is 130 kms far, Florence 110 kms and Siena 80 kms: in a few words, Chiusi is in the heart of Tuscany!